Two years after moving to Bulgaria from England, my dream to move a horse into our yard became a reality. We had fixed up the house, cleared the jungle and turned it into a productive vegetable garden. After making a barn in the corner of the yard into a lovely airy and spacious stable, we put the word out amongst the locals that I was looking for a horse. It wasn't too long before Karina arrived. I knew from the start that there would be challenges. Karina was a feisty four year old who had had little handling, and what she had experienced had been pretty rough. Horses are a very macho thing here and there is not much room for gentle and sympathetic handling. So she came to me full of fear and aggression. I knew I had my work cut out with this pretty little lady, but I hadn't realised that one of the biggest issues would be her feet! At this point, although I had read some interesting articles about the barefoot movement, I was still in the mindset of the old school of horseshoes and farriers. I knew quite a few, both professionally and socially, having grown up and lived most of my life in fox hunting Leicestershire. All of them masters of their trade. So when the man I bought her from offered to send his farrier to see us, I was most grateful. This will be the first and last time I will ever call this man a "farrier". There are so many horses in this part of the world, it never entered my head that finding a competent farrier would be a problem. Right from the start I realized that this man and I were not speaking the same language, I don't just mean English/ Bulgarian, although that was true. It was more about the language of the horse. He also didn't wish to talk to me (a woman) regarding my horse, instead addressing my husband as if I were invisible. Given that at that time I had little choice, I went along with his fitting of front shoes and asked him to trim the hinds, I had already decided that it might be wise to have no hind shoes until Karina and I were better acquainted. He obviously felt this was a waste of his time and rather inconvenient. Not able to manage this task alone, he called another man to hold her hind legs. With a rope round her fetlock they managed to roughly trim the hooves. After they left I saw the lacerations on her legs where the rope had dug in... I cried and swore that this would never happen again. Here in Bulgaria anyone can buy horseshoes at the local market or even in a hardware store. After that all you need is a hammer and a bag of nails. So off came the shoes, actually they pretty much fell off on their own. To begin with I had to beg for help from a couple of locals who I trusted not to traumatise Karina further. I couldn't even pick up her hind feet for several months. Slowly, little by little and with a lot of help from my non horsey husband, I finally got to the point where I could pick up and trim her feet myself. Huge learning curve... for all of us. One thing I did learn, the more you try to restrain a frightened horse, the more it will fight you. I always trim Karina untied. After a year or so of trimming by myself I was lucky enough to find, via the internet, a couple who travel to Bulgaria from the UK to barefoot trim. 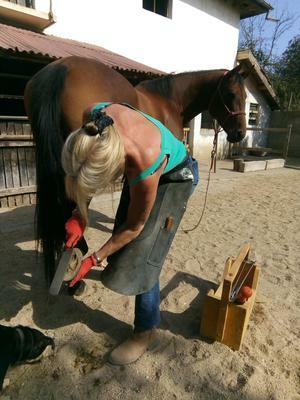 Ralitsa Gancherova is a vet and Nick Hill an ex farrier who is now a committed barefooter. They have helped and guided me on many aspects of Karina's care. I mentioned the stable at the beginning of this piece. The door is never closed, Karina is free to move between a sand covered yard, her stable and a small paddock....24/7. The story goes on, lots of issues and challenges, most of which are connected. I have made mistakes and will no doubt make more, but I have learnt from them and on the whole I have a happy, healthy horse who will never knowingly be traumatised again. The hammer and nails are for fixing fences and horse shoes are for decorative purposes only. Five stars to your excellent website ! Thank you for the opportunity to share some of my experiences. Moving to a new country can be quite challenging, especially with a whole new language. It is so nice to talk to other people who understand both human and equine languages. Don't get me wrong, I love living in Bulgaria, wouldn't change it for the world. It is a great big adventure,every day,and in every way. I've just turned 58, never would have believed I could have taken on such challenges. But I can and I'm loving it. Happy people make happy horses ! Thanks so much for describing your journey with your horse and discovering barefoot! It's a great example of how a challenging situation can push us to change our ways for the better, grow our understanding and learn new skills. Your intention was to do the right thing for Karina's well-being, and that guided you to make such good choices. Best wishes for your continued journey together!